The Earth is big, and we humans are small. We knowingly live on the most vulnerable planet is modern history, yet visualizing our individual responsibility can still be a challenge. But our actions matter. Everything matters in a world made of matter. Especially in today’s postmodern world, seemingly inconsequential decisions can have the most profound, lasting effect. Enjoy one sustainable, plant-based meal. Population growth is outpacing food production. Nearly half of the Earth’s arable land is dedicated to agriculture, 70% of which is dedicated to livestock. Since we haven’t yet located a backup Earth, we will need a backup plan. Even though agricultural productivity is increasing, many experts believe that population growth will outpace food output within the foreseeable future. The gorilla in the room is a cow. Our favorite foods like beef and dairy are the biggest contributors to pollution, water usage, waste and carbon emissions. Did you know that about half of America’s water usage goes toward raising animals for food? 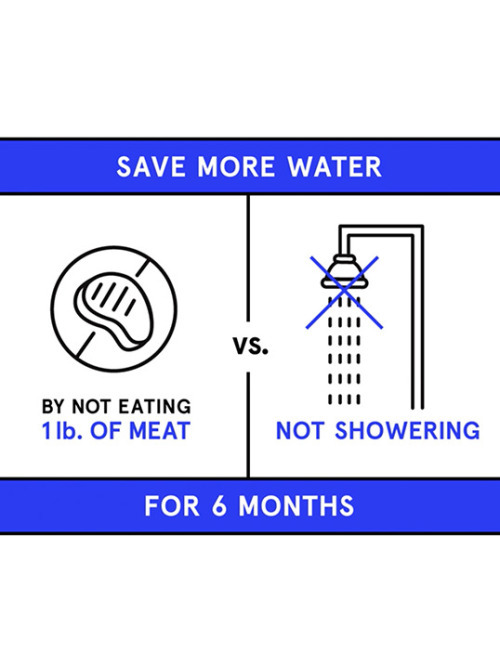 One pound of beef requires 1,800 gallons of water (1)! That’s right! Old Bessie drinks up three Olympic swimming pools during her lifespan. Today’s modernized water cycle has an incredible impact on the planet. After Bessie drinks and excretes it, it gets transported, purified and transported again and again. Meanwhile, water usage per pound for most plants, especially scientifically developed seed and legume crops is a fraction of that. When a quarter pounder is equivalent to a 4-hour long shower, it makes sense to consider some smarter alternatives. Addressing the sustainability of our eating habits is simpler, less obvious way to make an even bigger difference, every single day. For every apple you eat, another goes into a landfill. Food waste is such a… waste. Meat processing, retailing and storage lets about 20% of Bessie to go uneaten and end up in the trash (2). And it’s not just our gentle hooved friends – 35% of fish end up in landfills - equivalent to 3 billion Atlantic salmon. And here’s the catch-22 about our plant-based, colors-of-the-rainbow diets: 45% of fruits and vegetables grown never get eaten. Part of Soylent’s mission is to minimize waste by selecting sustainable, science-based sources of plant-derived ingredients from sources, like soy and corn. We leverage advanced, safe breeding technologies that offer crops with no discernible difference other than better yields and lower water and chemical input requirements. And then we have developed processing technologies that removes impurities and contaminants and provides a longer shelf life with no spoilage. The end result is that we can process and use the entire plant, while wasting very little. Addressing how we process, package, distribute and consume food, and handle food waste is critical for our future here on Earth. We’re going to need these technologies to minimize the impact on the environment, and more efficiently feed a rapidly growing human population farther into the future. Follow us on Instagram and join in the conversation. 8. Vox: How much of the world’s cropland is actually used to grow food? 12. BBC: How many Earths do we need?